1. New Two Graphics ” Euro and Copa America ” By MR.LAK. 2. New Scoreboard ” Euro – Copa America “. 5. Add New Kits For Euro 2016 Teams. 6. Add New Kits For Copa2016 Teams. 7. New Start Screen Euro 2016 and Copa America 2016. Special Thanks : Prince Houssam , MR.Lak , konami dz , pes patch , akonami , pesedit.com , pesegy . 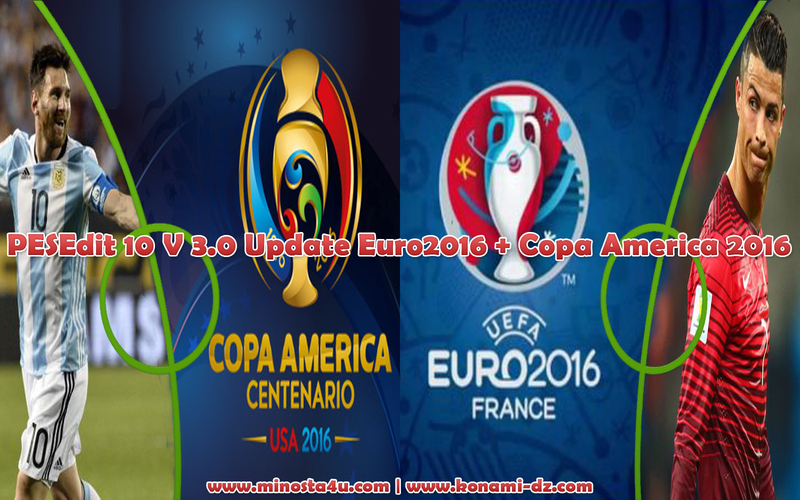 PESEDIT 10v3.0 Update EuRo 2016 And Copa America Centenario 2016 is error. Please upload again. How to change Euro 2016 graphic? Please help, can I in any way get Bosnia back? Every bosnian player is now Albanian altough the skills and the faces are same. I have "Cikalleshi" instead of Dzeko in Roma, Berisha is Begovic in Chelsea, some Albanian instead of Pjanic in Roma/Juventus, Besic is someone else in Everton… Also the league structure is not updated, and clubs are not promoted. Old emblems of Europe national teams were all the same, not some are in circle and some not. Please can you fix that in a new update? we will need it soon, there are a lot of new summer transfers going on! Greetings, you are my favourite patcher. My God what happened to you, you used to have the best patches! Most players in other leagues are DUMMY players, and Dummy players are everywhere. Also 3-4 other teams are THE IRELAND NATIONAL TEAM. Who knows what else is not ok… please can you fix those problems! HOW TO PUT BOSNIA AND HERZEGOVINA PLSS HELPP ?? ?